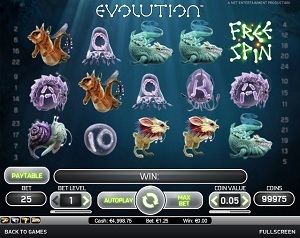 Evolution is an underwater-themed online video slot game that has been released in September 2012. This online video slots game has 5 reels and 25 pay lines. The theme of Evolution is hugely based on the majestic and wonderfully weird creatures of the deep blue ocean. This slot game features different types of weird animals that are not usually seen by people, and they have always been an object of fascination to deep-sea divers and marine researchers everywhere! A nice thing about Evolution is that when you get to activate its Free Spin Bonus Feature game, you can be transported to another entirely new world called the Evolution Feature, wherein creature symbols evolve into much higher symbols and award you with higher wins! To add “sweeter toppings to the cake”, you can be awarded additional free spins within the Evolution Feature, thus you stay longer in their world which gives you the chance to make even bigger winning combinations! Since the Evolution online video slot machine game is brought to you by Net Entertainment, you can play the game instantly without the hassle of downloading it first. With bubbly graphics and sound, free spins, a maximum coin jackpot of 5,000, a maximum cash jackpot of $2,500, 25 pay lines, and a generous Evolution Feature game that gives you the chance to get bigger wins, Evolution is absolutely the perfect online slots game for those who loved swimming and diving into the deep, as well as those who are captivated with the unique beauty of highly-misunderstood deep-sea creatures. Evolution has been designed to suit online slots players who have a fascination for the weird but uniquely beautiful creatures of the unknown. Set in the depths of the underwater world, where light fails to touch the water-submerged ground, Evolution is truly magnificently crafted! You will even see a silhouette of a shark wandering behind the reels! The symbols they have created features animal oddities that you will think they are either cute and cuddly, or they are creepy and scary. The spinning direction of the reels are not like what you see usually in online slots games, as instead of them spinning down, the symbols spin upwards from left to right. If you have triggered their Evolution Feature game and have completed it, you will see an exciting meteor crash as your winnings are added to your balance (what a nice way to throw you back to the main game, huh?) The overall graphic design of Evolution is very stunning, with the primary colors being blue, black and purple. Other colors showcased are green, red and brown. Evolution has great sound effects that you would usually hear when you watch TV shows about nature documentaries related to the dark, vast and extremely deep oceans of the world. The background game sounds that you hear when you spin the reels are made from water bubbles. If you love to explore the deep ocean and you’re fascinated with odd underwater creatures, then for sure you will love playing the Evolution online video slots game! The card deck symbols available in the Evolution slot game are enclosed in different transparent organisms such as 10 (Primo Blobulus), J (Blobulus Astrum), Q (Jellocus Finnum), K (Jellocus Squidae), and Ace (Crustacio Springum). The regular symbols that you will see in this slots game are: Draconius Rex (a weasel-like animal with wings), Basilisk Pluma (a shrew-like animal with a colorful red-blue plume around its neck), Basilisk Hairicus (green primate-like animal with a long snout and bright bulb on its tail), Bestia Dentum (an eel-like reptile), and Albus Slugus (a snail). The Wild Symbol is the Bubble. It can act as a substitute for other symbols in order to help you complete winning combinations, with the exception of the Scatter symbols. It only appears on the 2nd, 3rd, 4th and 5th reels. The Scatter Symbol is the Free Spin. This means that the Free Spin scatter symbol is not needed to come out in a line in order for you to win. The Free Spin scatter symbol can be scattered anywhere on the 5 reels for you to complete winning combinations, as long as there are 2 or more Free Spin scatter symbols that appear. Your winnings are calculated via multiplying the Free Spin symbol combination payout (refer to the Paytable), by the total number of coins you’ve bet. If you hit 3 or more Free Spin scatter symbols, you will activate the Free Spin Bonus Feature game. Take note that if you obtain a scatter win and a regular win, you are paid out for both wins, because the Free Spin scatter symbol is not needed to come out (on an enabled payline) for you to win. Scatter winnings are entirely independent from pay line rewards and are therefore included to your pay line winnings. There are two different Bonus Features that you can play at Evolution slots, but you have to activate the Free Spin Bonus Feature game first in order to play the second bonus feature game. • Evolution Free Spin Bonus Feature game – If you hit 3 or more Free Spin scatter symbols (scattered anywhere on the 5 reels), you will trigger the Free Spin Bonus Feature game. If you hit 3 Free Spin scatter symbols, you will be awarded 10 Free Spins; if you hit 4, you’re awarded 15 Free Spins; and if you hit 5, you will be awarded 20 Free Spins! When the Free Spin Bonus Feature game has ended, you are returned to the main Evolution video slot game and your Free Spin wins are included to your total win. • By winning symbol combinations, you can activate the Evolution Feature in the Free Spin Bonus Feature game which starts just after the payout. Following a payout on any winning symbol combination, all of the symbols in that winning combination (as well as all identical symbols on the reels) will evolve to their next symbol level, with the exception of Bubble Wild symbols. When different winning symbol combinations occur simultaneously, the winning symbols evolve again to the next symbol level independently (of each other). The reels practically stay the same until a new winning symbol combination or up until the Free Spin Bonus Feature game ends. The Evolution Feature only applies as far as the highest symbol within each and every symbol group. There are 2 symbol groups (each with 5 symbols): the simple organisms Ace, and the complex organisms Draconius Rex. For instance, if you get the Jack symbols to appear in a winning symbol combination, you are paid out for this, and then the symbol will evolve to its next symbol level, which is Queen. This means that all Jack symbols will be replaced with the Queen symbol, and the reels stay the same until a new winning symbol combination is hit or up until the Free Spin Bonus feature game ends. When the Free Spin Bonus Feature game is over, you are then taken back to the main Evolution online video slot game and your Free Spin game wins are included to your total win. Hint #1: The Bubble Wild symbols will not evolve during the Evolution Feature, and all the Free Spin scatter symbols are taken out during the Free Spin Bonus Feature game. Hint #2: The Free Spin Bonus Feature game cannot be re-activated while playing the Free Spin Bonus Feature games. Evolution has 5 reels where you may bet on as many as 25 pay lines. The minimum bet for is 0.01 and the maximum bet is 0.50 per line. You can wager from 1 up to 10 coins per pay line. People who often play online casino games usually love to stay much longer on online slot games that have an Autoplay function. Good thing that Evolution has one! You can have the game spin for you automatically with the Autoplay function that can be found on the lower left side of the game screen. With the simple setting, you can choose a button (from 10 to 1000) which means that those are the total number of spins that will be spun automatically for you. With the advanced settings, you can decide to Stop Autoplay on any of the following conditions: on any win, if Free Spins is won, if a single wins exceeds a certain amount you indicate, or if your cash increases or decreases by a certain amount you designate. After putting in your preferences, just click on the Start button and the game will automatically spin for you while you just sit back, relax and enjoy playing this fun water-filled online video slot game!